Are you sure Vinayaka Hospital is closed down? 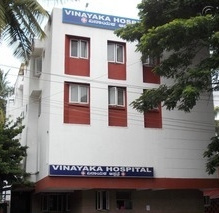 Vinayaka Hospital is listed in revaalo under Multi Specialty from Bangalore. Reviews, Ratings, contact details, services: . Average hospital good doctors. There are manythings to be cleared or improved. Doctors are good. Staff needs to be active and professional. Average Hospital. Docs are good. Needs a lot of improvements now. previously it was v goood. Doctors are good but, the staff and the nurses needs improvments. overall average hospital. The gynecologists here are very good. This is so bad a hospital I have seen till date. There is no proper facilities & they are only established to loot money. I was admited there and they didn't discharge me even after I was alright. Even many people in hospital were complaining the same. Nurses are not trained to treat patients. I have been visiting this hospital from past 6 months. Some of things i feel requires improvement, no proper management. u can take appointment over a call and at time of consultation u have wait at the door or somebody else without appointment will rush before you. Hospital cleanliness and hygiene could be improved.